London, UK. 08.06.2014. Sharlene (Flavia Bertram) and Pamela (Ayesha Tansy) present the "Ugly Architecture" walking tour, from Tack On Tours, as part of the London Festival of Architecture 2014, in the streets of central London. The comedy walking tour takes in notable 'ugly' buildings and encourages debate on what is and is not aesthetically pleasing to the individual. 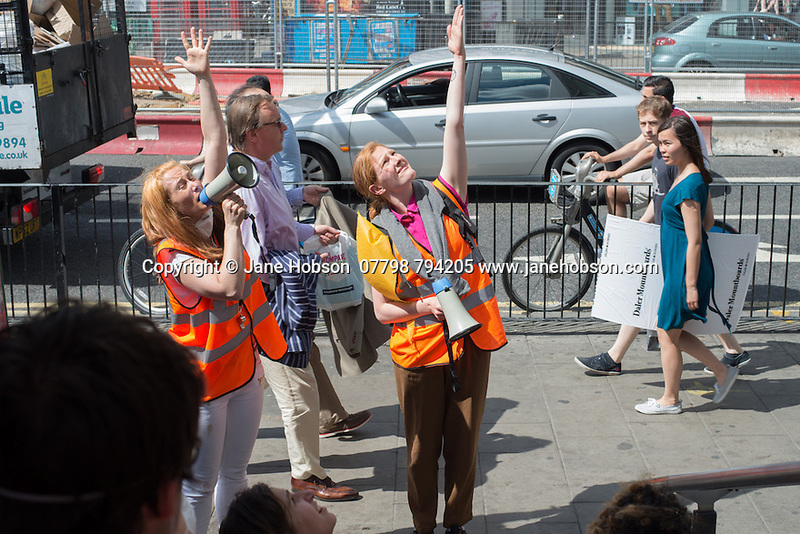 Picture shows: Pamela (Ayesha Tansy) and Sharlene (Flavia Bertram) shouting and gesticulating upwards, at Centrepoint, whilst passersby look on. Photograph © Jane Hobson.